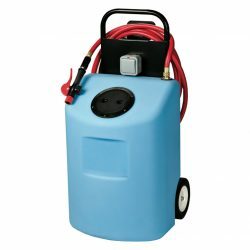 The 20-Gallon AC-Powered Watering Cart offers a reliable and precise solution for watering lead-acid forklift batteries. Battery performance and longevity can permanently decline when batteries are underwatered or overwatered. This unit comes with a Water Gun that automatically shuts off when the proper electrolyte level has been reached, ensuring that boil-overs and dry plates are easily avoided. The 20-Gallon AC-Powered Watering Cart has a 15-foot retractable power cord and a 15-foot output hose, giving it 30 feet of total reach. The wheeled polypropylene tank carries 20 gallons to easily service mid- to large-sized forklift fleets. This unit can also be used as a water supply to a single point watering system. Give your staff ergonomic and economical equipment, and get more life and productivity out of your batteries. Contact 1.800.BHS.9500 to learn more about the 20-Gallon AC-Powered Watering Cart or other BHS Battery Watering Devices.